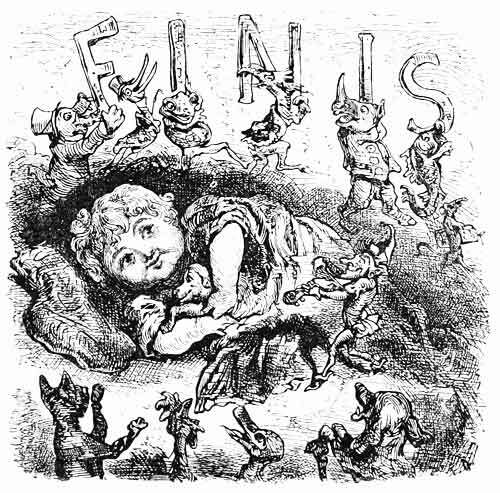 The fables marked with the symbol to the right represent 1874 versions collected by the un-named editor J.B.R. who’s Preface is reproduced below. Earth gave all fruits, nor asked for toil again. Mortals and gods were wont to mix as friends. What is known of the life of Aesop is briefly this:–He was born probably in Phrygia Major about 620 B.C., and died about 564 B.C. or it may be a little later. Herodotus mentions him as having been, along with the beautiful Rhodopis, a slave in the service of Iadmon, who eventually gave him his liberty. The name of a former master was Xanthus. Plutarch speaks of Aesop as being present, with Solon, at the court of Croesus, King of Lydia. He appears at Athcns in the time of Pisistratus and Periander (see the Fable of the “Frogs asking for a King,” and the “Fox and the Hedgehog“). He was sent by Croesus to distribute a sum of money among the Delphians : a dispute arose, and Aesop saying that they were unworthy to receive the money, refused to give it. The Dclphians, enraged, got up a charge of sacrilege against him, and he was thrown from a precipice and killed. The Delphians were afterwards visited by plagues, which as punishment by the gods for his unjust death. They accordingly offered a sum of money as compensation for the injury, to any connections of Aesop who might be living. In default of any nearer connection, the money was claimed and received by the grandson of Iadmon, the master to whom he owed his freedom. A statue by the hand of the celebrated sculptor, Lysippus, was erected in memory of Aesop at Athens. There is no reason to think that he was ugly or deformed. Among the earliest known collections of fables bearing the name of Aesop, were those of Phaedrus and of Babrius. That of Phaedrus is writtten in Latin, and dates from the commencement of the Christian era, or about 560 years after Aesop’s death. That of Babrius is in Greek, and its date is variously estimated by critics as between 250 years before Christ, and 200 years after. Babrius was known only by reference and quotation until the year 1844, when a manuscript, apparently lost in the Middle Ages, was accidentally discovered in the convent of St. Laura, on Mount Athos. This M.S. was purchased for the British Museum, and was published, with critical notes, by Sir George Cornewall Lewis in 1846. A translation of the Greek text into English verse was made by the Rev. James Davies, and published in 1860. To this interesting volume the present editor is indebted for many hints, and for the substance of a few Fables which, as far as he is aware, now make their first appearance in English prose. In addition to many other collections of the Fables, one was made in the fourteenth century by Maximus Planudes, a Greek monk of Constantinople. To this author some attribute the extravagant stories which have been so often reprinted as the “Life of Aesop the Phrygian.” Some of these apocryphal stories have become so bound up with the name of Aesop, that, rather than reject them, it has been thought desirable to follow the plan adopted by Croxall, and incorporate them with the Fables themselves. “The Subtyl Historyes and Fables of Esope,” translated from the French, was one of the books printed by Caxton at his press in Westminster Abbey, in 1484. The charming poetical version of the Fables by La Fontaine, which appeared for the first time in 1668, has been largely made use of in the compilation of the present volume. The English editions which have been most closely followed are those of L’Estrange ( 1694) and Croxall (1 727). Of the vigour and point of the first of these there can be no question; but it is disfigured by unnecessary licence of expression, and now obsolete idiom. The second contains much quaint humour, but the Fables are of unequal merit, and at times are lengthy and somewhat wearisome. In revising these editions to suit modern tastes and current modes of expression, no principle has been followed save that of trying to exhibit each Fable in its liveliest and most attractive dress. To this end, in some cases, almost the exact words of Croxall and L’Estrange are given; in others, the versions of these authors have been added to, altered, or curtailed; while in not a few the dress is almost, if not altogether, new.